Introducing my guest blogger for today, Anjali! I've known her since the beginning of time, honest. She has FIVE awesome nail art designs to show you! Hey everyone! I’m Anjali and I blog over at From L&P to English Tea. I’m super excited to be here today at Nailed It NZ. Jessie and I have been friends forever…well, for nearly 15 years and that’s pretty much forever!! Just a quick ‘who am I:’ I'm a proud Kiwi but I live in England at the moment and will probably here another year. I blog about my time in a new country, as well as (and perhaps mostly) music, photography, art, a whole lot of D.I.Y, a concerning obsession to Harry Potter and, of course, nail art! Which is why I’m here today! Today I'm going to show you guys 5 of my favourite nail at designs that I've done this year, but before I do, I just want to say that my technique and tidiness is none existent and please please please ignore the state of my fingers in these photos – I've got quite dry hands (because of my hatred of hand cream, I'm sure) and also have quite bad Eczema that occasionally flares up. Anyway! Moving on! Although I've always loved doing my nails, and was really excited to come to the realization after I left school 4 years ago that I could paint my nails a lot more – University didn't care about the state of my fingers! Hazaa! But this year I've got into it a lot more, and have enjoyed trying new crazy designs and also trying things that are more detailed. Today, I thought I’d just show you my Top 5 favourite from this year’s lot, and a little about them! #5 Piano Key Nails: I love these. Sure the lines are wonky because I didn't have a striper brush back then, but they still got some comments. I love playing the piano/keyboard, and I kind of wanted to paint the keys of my piano bright happy colours. But alas. I could only paint them on my mini canvases here. 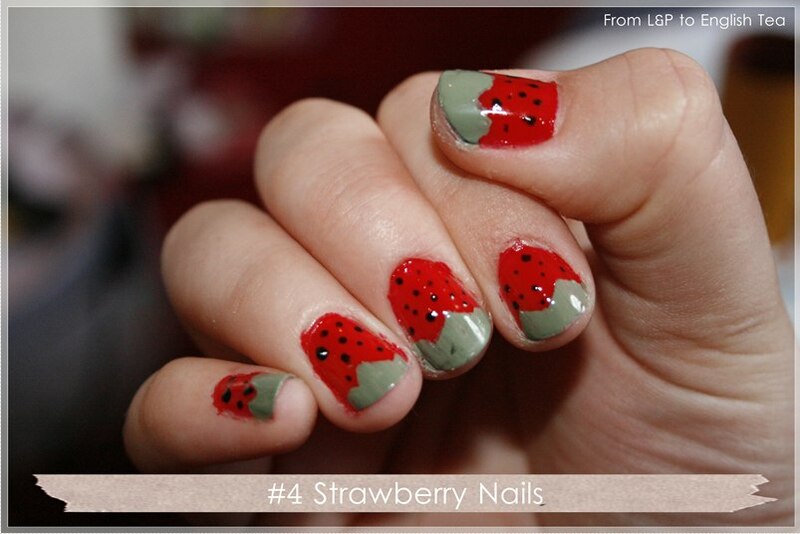 #4 Strawberry Nails: Who doesn't love strawberries?! Actually, now that I've said that, I enjoy raspberries better…but there’s nothing quite like a juicy strawberry…especially if it’s covered in chocolate. Am I right?! Anyway, I did these in the summer (Northern Hemisphere summer) and really like the end result. Although they are simple and the green isn't as bright as I would have liked, they were fun to do and they made me want to eat strawberries every time I saw them. #3 Forest-Like Nails: I didn't know quite what to call these ones. But the kind of reminded me of a forest, you know with the green and the brown (I made that brown, by the way. You can see the tutorial here) and the lines sort of make it look like trees and branches. Yeah? Maybe? Anyway, I really liked this look, and though I not normally a greeny-browny person, I did enjoy painting these and playing around with lines…I did it all with a tooth pick because I didn't have nail art brushes then, but I think it worked okay! #2 Stripes Nails: The other day I bought some nail art brushes off Amazon (LOVE that site), and I had to try out the striper brush, because that was the one I was most excited about! I've always loved seeing Jessie’s stripy nails with perfect thin stripes! So now I can finally make them too! I played around with the colours a little bit – I love my new purple (brand is NYC which, if you live in the UK, you can get for quite cheap at Super Drug), but I wanted something bright too, hence the orange. I know it’s simple, but I can’t keep looking at them! They are on my fingers now, while I'm typing this! #1 Panda Nails: And my favourite this year has to be my panda nails. I love pandas – they are by far my favourite animal. So when I realized that I could create panda faces with a dotting tool and really simple colours, I was super excited! As you can see, I just did a green base colour, then a curved circular-like shape at the tops of the nails, and then the rest is just black and white with various-sized dotting tool! I loved these so much! Aw. Just look at them! Cute little pandas. So that’s my Top 5 Nail Art Designs that I’ve done this year. There have been lots more, which you can see on my blog, and then just hit the tag ‘nails’ and you’ll be able to see them all. I’m really excited about two things at the moment: a) the nail art brushes that came the other day, and b) the 31 Day Nail Art Challenge Take Two that Jessie and I and our other friend Hannah have created. I know Jessie keeps reminding you, but here I am, reminding you again! It’s going to be awesome!! So, that’s all from me today folks! Hope you’ve enjoyed this! You can find me around the interest in various places, so feel free to stop by and say hey, or follow me somewhere…or everywhere! Thanks, Jessie for having me! It’s been fun!! Your welcome! These are awesome! Thanks, Jazz!! :D I don't normally use my red nail polish very often, but I really liked these ones! owww the strawberries are so cute! !